The last thing you need when you get your lounge, armchairs and upholstered furniture cleaned is to be left with damp and soggy upholstery. Not only is it deeply inconvenient, it’s also a sign that your upholstery has been cleaned using old fashioned hot water extraction (also called steam cleaning) methods. As well as leaving you with wet furniture that can take days to dry out, steam cleaning can also leave sticky chemical residues that quickly attract new dust and dirt, and the harsh chemicals used can leave a strong and unpleasant chemical odour. 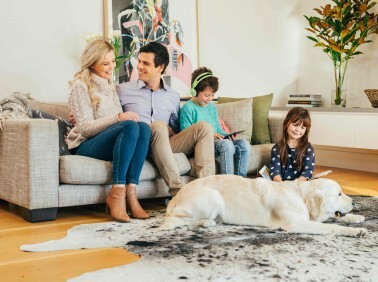 The Myhome Dry-Touch System means we can give your chairs and sofas a much deeper and longer lasting clean – removing deeply ingrained dirt, dust mites, oils, and allergy-inflaming proteins and particles from your upholstery. The Dry-Touch System uses highly advanced encapsulation technology to give you the best clean possible, with none of the unpleasant side effects of older cleaning systems – such as steam cleaning or hot water extraction. What is Encapsulation and How Does it Work? Encapsulation begins (after a thorough pre-clean spot and stain treatment) with the application of a special polymer forming spray. The encapsulation spray contains both polymers and detergents, which work together to attract, capture and release dirt. When applied, and after the detergent has done its job in attracting the dirt and debris, the polymers fully encapsulate and crystallise the detergent-dirt mixture. Once dry, this creates a crystallised ‘bubble’ that can then be safely vacuumed away removing all the dirt and cleaning solution, without leaving any sticky chemical residue. There are six key steps to the Dry-Touch System – each step plays a critical role in ensuring that you get the most thorough and long-lasting upholstery clean possible. 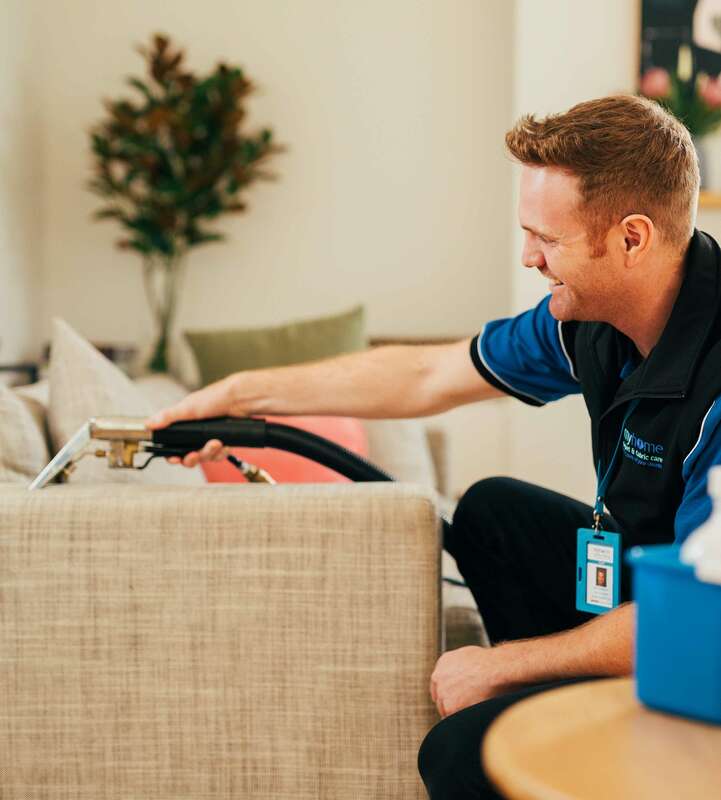 The technician uses a hospital-grade SEBO filtration vacuum to remove built-up dust, dirt and dust mites – giving each piece of furniture a thorough pre-clean. Your technician then uses a range of powerful non-toxic pre-treatments and specialist equipment to pre-treat marks, discolouring and stains. Each stain is individually treated with the most appropriate cleaning products and techniques. Pre-treating stains ensures a consistently thorough clean. Using our specially designed sprayer we apply a fine layer of encapsulation product to the fabric, beginning the polymer process. The detergents and polymers work together to attract, capture and to prepare for the clean release of dirt. Next, using our specially engineered orbital scrubber we gently massage the encapsulation product into the individual fibres – ensuring a deep clean. Once we’ve finished treating your sofas and chairs, we’ll thoroughly vacuum and groom the fabric so your upholstery will be clean and completely dry within one to two hours, and will look like new. The next day, we return to give your treated upholstery a thorough final vacuum and tackle any remaining stubborn stains with a second treatment if necessary. Harmful pollutants and proteins are filtered out keeping you healthy and reducing allergies. Upholstery Cleaning Special Offer – Your 3-Seat Sofa Cleaned for just $95! Take advantage of this special offer now to experience the power and effectiveness of the Myhome Six Step Dry-Touch Process – a 3-Seat Sofa Cleaned for just $95! There is limited availability with this offer, so call 13 22 31 now to book your upholstery clean now. Our Dry-Touch technicians follow a strict cleaning system using the latest and most up to date technology and equipment – to ensure that all stubborn stains and hard-to-reach dirt is removed. Myhome upholstery cleaning revives your furniture fabrics leaving them plush, inviting and stain-free – we guarantee it.